But there’s a catch. Our lives are not automatically interesting. On the page, our lives are not interesting at all until our language comes alive. So how do the best writers transform what happens inside them into compelling poems, stories, essays? Close observation often comes first. We might return to a moment, to an image. The muddy drawers of a girl sitting on a branch in a pear tree. A handbag the shape of a hippo’s head. The aromas of stables, before and after mucking out. The haunting rhythms of a song in a language you and your best friend invented. What scared you. What still scares you. Your secrets. Your greatest sources of shame. What you can’t make better. What you’ll never understand. From a mindfully observed moment, we select evocative details, the ones filled with an energy we can’t quite comprehend. Often these are images that return to us, again and again, though we don’t always know why. Know that we can’t exhaust any image. If we stick with it and go deeper into it, it will lead us places we never planned to go. Heading willingly into the not-knowing—that’s one sign of a writer whose work will nibble at the edge of something vast. Vast and beyond control. This is scary. And exhilarating. “If you have only one mind, or one cooking pot, you will be forced to entertain a hodgepodge,” writer Amy Leach reminds us. From our hodgepodge, we must select. How we select will determine the structure of our lines and sentences, the quality of our thought, the depth of our emotions on the page. Selection might also determine tone, and reshape the world. Amy Leach again, from a different essay: “In the seventeenth century, His Holiness the Pope adjudged beavers to be fish.” That’s wild enough right there to keep this reader reading. Then Leach offers this: “In retrospect, that was a zoologically illogical decision; but beavers were not miffed at being changed into fish.” This sentence begins quite reasonably, but ends with something nobody could ever know. (It’s also a delicious sentence to read aloud.) Deep play disguised as a straight-faced proposition intrigues. The essay continues as if this were a perfectly rational way to proceed, comprehending the inner lives of beings whose lives have been misconstrued by some authority. And who are we if not beings whose lives have been misconstrued? When a cow came slouching by in the field next to me, a mere artist might have drawn it; but I always get wrong the hind legs of quadrupeds. So I drew the soul of the cow; which I saw plainly walking before me in the sunlight; and the soul was all purple and silver, and has seven horns and the mystery that belongs to all the beasts. As writers, we are wranglers of that mystery. The not-knowing might begin much more simply, with something we remember. The first time we realized mom was lying. A child’s sense of justice, violated. A world no one else can see. A grandfather’s favorite split-handled ball-peen hammer. A hated neighbor’s simpering turn of phrase. The writer places us clearly in a scene. But why are we there? What occurs to us because of what happens to us? That’s at the heart of the inner life and also at the heart of literature. This is the realm of the imagination, where we reflect and make connections. This is the so what, the part that matters, the part that sticks with us. In many early drafts, we get the what, but not the so what. We see the event, but never get close to the inside story. The juxtaposition transforms the image into metaphor, allows it full power, and creates connections found only in the imagination. Most humans could stand a hundred years before those tattered fibers and never link them to a disease that eats away at a loved one’s brain and mind. The fully engaged poetic mind leaps. its purple and red striations unbroken. not knowing what to expect. an expert on such things. Very often in drafts that play dead on the page, our loyalties remain misplaced. We stay true to “what actually happened” (as if memory could recall even one moment in toto). We get stuck in mere factual accuracy, which is never enough, even in nonfiction. Accuracy resides squarely in the category of “necessary but not sufficient.” When we get the facts wrong, our credibility evaporates. When the laws of physics go wonky, the whole piece refuses to fly. So we get right what we need to get right. And then we face deeper concerns. As writers we have stronger loyalties—to metaphor, to language, to the line, to the scene, to the lyric moment, to the narrative, to the made thing. We need to listen and to be loyal to the music of our language. Our first loyalties must be to craft, to making, to imagination. Our loyalty must be to serious play, to language made new, to words. We need to revel in words as if we’d just met them. The Argentine poet Juan Gelman suggests that words are immortal. They await us beside dark waters that bear our names. It’s our job to show up and meet them. And to be patient if they take their time. holds oceans that take one far away. Chesterton, C.K., quoted by Frank Key in Mr. Key’s Shorter Potted Brief, Brief Lives (Constable UK, 2015). Gelman, Juan. “Divergencias,” translated by Dan Vera as “Differences” (posted on Dan Vera’s Facebook page, May 3, 2016). Hirshfield, Jane. “Alzheimer’s” from Come, Thief (Knopf, 2011). Leach, Amy. The openings of “Pea Madness” and “In Which the River Makes Off with Three Stationary Characters” from Things That Are (Milkweed, 2012). Alberto Ríos, the opening of “The Purpose of Altar Boys” from Whispering to Fool the Wind (Sheep Meadow Press, 1982). Peggy Shumaker’s lyrical memoir is Just Breathe Normally. Her new and selected poems, Cairn, will be published in 2018 by Red Hen Press. Shumaker edits the Boreal Books series and the Alaska Literary Series, publishing literature and fine art from Alaska. 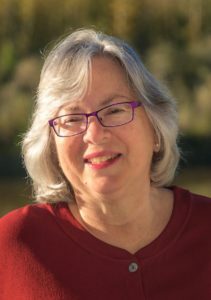 Professor emerita at University of Alaska Fairbanks, she teaches in the Rainier Writing Workshop low-residency MFA program at Pacific Lutheran University. “What and So What: Loyalties” first appeared in the Summer 2016 issue of RWW Soundings, the online literary and program journal of the Rainier Writing Workshop. Deeply played. Deeply felt. Thank you. Gorgeous and inspirational Peggy. Thank you. Fascinating essay. I’ve been struggling with my writing recently, working on a novel after the publication of a memoir “What Happened to My Mother”. That’s exactly what writing the memoir did, eventually, when I let it. I found myself going into places inside me I never planned to go, didn’t in fact know existed! And I realized I need to apply this ‘going deeper into it’ to the protagonist in my novel. To be willing to go places with her I never planned to go!! I knew something was missing in the writing. I just didn’t know what it was. Now I do! So thank you. Thank you.